After an impressive round it was Tia Squibb, from Brentwood, Essex riding the 14 year-old coloured gelding Gorm and Ban owned by Sarah Squibb that took the victory in the recent AGA Pony Bronze League 128cm Final. The small but mighty ponies thrilled the audience in the Grand Ring yesterday afternoon as the AGA Pony Bronze League 128cm Final was decided. This was the last final of the new pony National Championship which was introduced by British Showjumping earlier this year. With nineteen pony and rider combinations contesting the title only nine managed the all-important clear round to secure their place in the jump off. 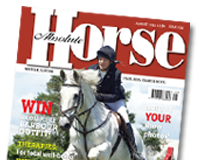 The jump off saw the competition quickly become fierce as Charlotte Bowman from Swansea, West Glamorgan riding her mother Mandy’s 14 year-old liver chestnut Bofarnel Lottery charged into the lead. With a score to beat, competitors stepped up to the plate with progressively improved scores as the competition went on. Tia and Gorm and Ban emerged victorious, finishing with a time of 38.93. Spectators were captivated by Tia on Gorm and Ban as they expertly demonstrated all qualities of a top pony jumping combination. This was Tia’s first Championship and she handled the pressure superbly emulating the attitude of a rider far beyond her years. Sarah Squibb, Gorm and Ban’s owner, was extremely pleased with the results: “she did so well, she deserved to win…we are very proud”. 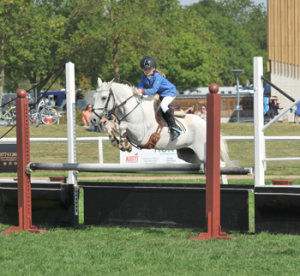 Second place was claimed by Ellie Burrell-Squibb from Brentwood, Essex, riding Patricia Squibb’s 12 year-old grey mare Minnie Mouse II, who delivered an impressive jump off just to be nudged out of first place. Ellie also took 4th place with Rahanane Lady a 23 year-old grey mare also owned by Patricia Squibb, her second ride for the final. The AGA Pony Bronze League 128cm Final proved an exciting climax to round up the new pony National Championship action.